Pioneers of Blackwood – Betsy Blackham, James Hickman and James Unwin. Betsy Blackham came to Blackwood in 1855 with Mr and Mrs Beddard as a servant. 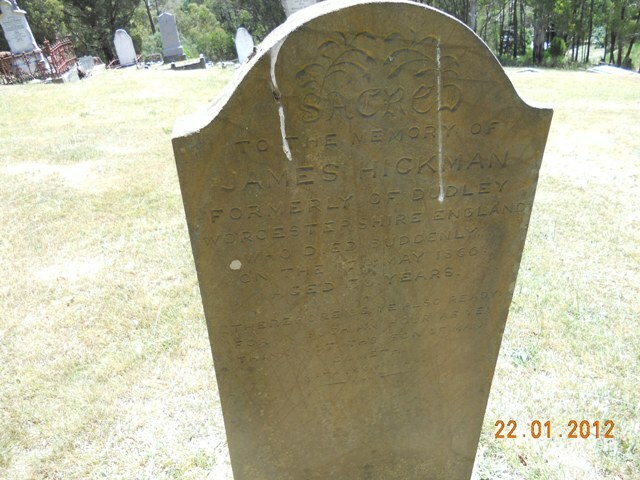 She married James Hickman in 1858 at Kyneton and after his death at Blackwood in 1866 she married William Unwin in Blackwood in 1869. Mr Beddard returned to England in 1868 and she was left running the business as storekeeper and she later was found to be running a hotel. The Bacchus Marsh Express newspaper – Saturday 3 October 1868. Betsy Hickman re-married William Unwin (from Cambridge U.K.) of Barrys Reef, Blackwood at the church of England. – Red Hill, Blackwood in 1869 and she died 18 months later from child-birth on 15th Nov 1871 at Red Hill, Blackwood, Victoria, age 33 yrs, born Staffordshire. Father listed as Joseph Blackham. Betsy Uwin is buried in the Blackwood cemetery in grave C of E Sect P no. 34, next to William Unwin. Researched by Margot Hitchcock from her forthcoming book “The History and Pioneers of Blackwood” hopefully to be published soon. For help with research of Blackwood ancestors contact Margot Hitchcock – email – margothitchcock@bigpond.com.